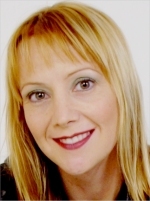 Brianne Siddall has provided voices for many well known anime characters such as Tsukasa and Elk in .hack//SIGN, Kenichi and Fifi in Metropolis, Calumon, Koromon and Tommy in Digimon. She can also be heard in anime titles such as Geneshaft, Kikaider, Saint Tail, Space Adventure Cobra, and Transformers: Robots In Disguise. Her work extends into video games with titles including not only the .hack games, but Xenosaga, Tales of Symphonia, Star Ocean: Till the End of Time, Final Fantasy XI, and others. She is also the voice of Circuit in Power Rangers and has played numerous roles network TV shows both in front of and behind the camera as a boom operator, stunt person, assistant film editor, assistant sound editor, and location scout. In her free time, Brianne has completed several marathons and a 1/2 Ironman Triathalon. She enjoys home construction, riding motorcycles, ice skating, and goofing off.